Well, the five little monkeys are back. 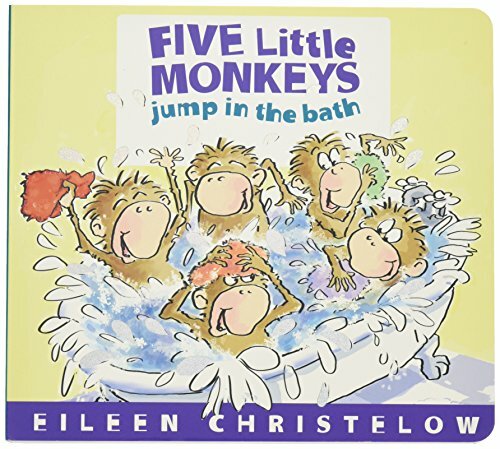 Five Little Monkeys Jump in the Bath by Eileen Christelow is the next chapter in the ongoing saga about those five impulsive little monkeys and their unending shenanigans. In this book, they get into much of the same mischief you might expect your infant or toddler to get into. They slurp sticky ice cream, splash in a sloppy mud puddle, and put their sticky hands all over each other. Like any self-respecting mother, Mama Monkey is horrified and draws a nice tub of cleansing bathwater for her babies. The monkeys splish, splash, slip on the floor, boo-hoo, then get right back to the business of being messy baby monkeys. Human babies who love hearing their parents read will enjoy sharing this delightful lap book. The text is exciting, fast-paced, and full of alliteration: “Five icky, sticky, yucky, mucky monkeys!” Also, though the main characters are five cleverly illustrated simians with child-friendly faces, children will still be able to identify with every wide-eyed expression of discovery, every joyful game of mud-splashing, and even the tender moment when Mama Monkey comforts the two babies who slipped getting out of the tub. This sturdy board book is designed to withstand pulling, tugging, and that inexplicable, often irresistible urge to rip the pages that many babies experience. The pages are easy to turn, so baby shouldn’t have a difficult time thumbing through to see what the monkeys are up to next. Two quibbles. First, the page edges—though slightly rounded to dull sharpness—might still present a bit of a safety hazard for teething infants. Also, though this book is moderately lightweight, it is still heavy enough to cause physical pain if a child drops it on her head or toe. Other than that, these five little monkeys will become as memorable and well-loved to toddlers as the other mischievous little monkeys who once jumped on the bed.